ship davit / for rescue boats / liferaft / hydraulic D-CRm.R. A life raft davit is simple, generally operated by hand without need for an electric motor. It consists of a pivoting arm holding a cable with a hook at its end. These devices are used in emergencies to lower life rafts over the side of a vessel. Both the davit pivot mechanism and the launch cable are usually operated by manual crank rather than a motor. 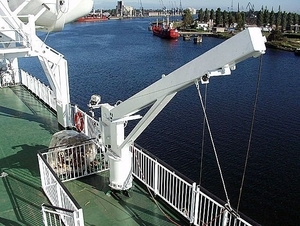 Life raft davits must meet specifications and requirements stipulated in the SOLAS treaty.